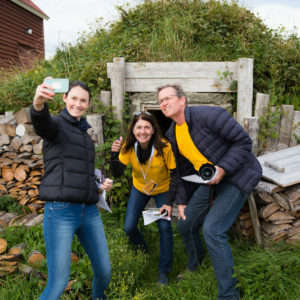 The Amazing Root Cellar Race has fast become the family highlight of the Unscripted Twillingate Digital Arts Festival. Akin to a treasure hunt / slash road race / slash history adventure / slash tweet storm, this is a fun way to explore Twillingate’s root cellars along a secret, but predefined route where clues have to be earned to complete the race. Armed with a smart phone and perhaps a GPS device, teams or individuals set out to uncover some of Twillingate 232 documented root cellars in an adventure that lasts about 90 minutes. Of course, everyone vies for the coveted Golden Turnip Award or at least, one of the other prizes on the table. Tickets are $15 per individual or $25 per team of two and includes T-shirts.